Create a Memorable Christmas City Experience For Your Group! 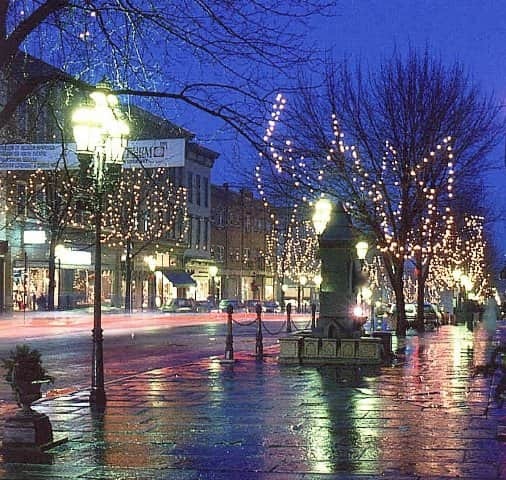 Founded on December 24, 1741, Bethlehem, Pennsylvania is “Christmas City, USA.” Each year, thousands of visitors journey here to explore the beauty of Historic Bethlehem, a National Historic Landmark District, at Christmas. Vote for your favorite tree in the Trees of Many Colors display and discover a cherished Bethlehem tradition, the Holiday Putz Trail. Download the printable Christmas Tours Information guide! Deemed “the best way to see Bethlehem,” a certified guide in period 1700s-era Moravian dress boards your bus and takes your group on a guided bus tour through the streets of this National Historic Landmark District. Travel to the site of the Christmas Star atop South Mountain, access historic highlights in north and south Bethlehem, and learn about holiday traditions past and present in Historic Bethlehem! Discover the stories of Bethlehem’s Moravian heritage and its founding in 1741 as your group journeys with a certified guide in period 1700s-era Moravian dress in a candlelight walk along the sidewalks of downtown Bethlehem. Hear the tale of a candle-in-every-window. Experience Bethlehem's exquisite Victorian and colonial architecture. Discover two National Historic Landmarks, the 1741 Gemeinhaus and the Bethlehem Waterworks. Learn about the renowned Bethlehem Star. Step inside the Moravian Museum of Bethlehem and immerse your group in Moravian Christmas traditions. Tour the Kemerer Museum of Decorative Arts, home to one of the largest antique dollhouse collections in the country. Vote for your group’s favorite Christmas tree featured at our historic sites in Trees of Many Colors, a display of Christmas trees decorated by the holiday decorating committee and the Bethlehem Garden Club. During the holiday season, your group will also be treated to acoustic guitarists and caroling docents performing Christmas music at our historic sites. From the German word meaning “to decorate” or “to embellish,” a Christmas Putz is a traditional Moravian Christmas decoration depicting various scenes of the Nativity story through intricately handcrafted figurines, animals, and buildings. The Holiday Putz Trail includes holiday Putz displays at three historic sites: Moravian Museum Gemeinhaus, Single Sisters’ House, and 1810 Goundie House. Reserve your group’s visit to Central Moravian Church’s treasured Putz display, then enjoy an unforgettable Moravian Music Experience. Lunches and special holiday receptions for groups are available by advanced reservation and can be arranged by contacting Historic Bethlehem Museums & Sites at 610-882-0450 ext.19. Pricing and menus are available. For more information about Christmas Tours or Custom Tours, please contact 1.800.360.TOUR or email Kristen Walsh.